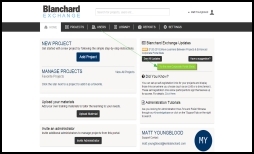 We are pleased to announce two new updates to Blanchard Exchange! We are introducing early-access to a beta version of an enhanced Corporate (Administration) Portal , which brings mobile/tablet device optimizations to the interface. 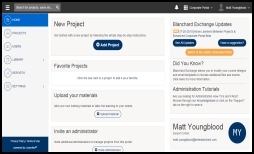 Included within this enhanced Corporate Portal is the Learner Move function, which allows Administrators to move learners between projects while keeping any assignment completion status attached to those Learners when moved into new projects. See below for detailed information regarding both updates/features. Note that this enhanced Corporate Portal is in a beta stage. Minor bugs/display issues may be present. We may make additional modifications to this interface prior to making it the new default interface for the Corporate Portal. When viewing the "Home" tab of the current Corporate Portal, a button is now included to toggle to the beta version of the enhanced Corporate Portal (see screenshot). Upon accessing the updated interface, this same button will allow you to switch back to the classic interface. The updated Corporate Portal brings mobile/tablet device optimizations, making it easier/faster to accomplish administrative tasks for individuals on-the-go. Note that the Corporate Portal still functions the same and the overall process for setting up and managing projects has not changed. The main navigation is now vertical instead of horizontal. The main navigation has been moved to the left on desktop/laptop/tablet devices, with an option included to "collapse" the navigation to save on screen space. On smart phones or similar devices, the main navigation has moved to the right (the main navigation is also "collapsed" by default on mobile devices by default to save on screen space). The recently launched Notifications feature is also tied to this interface, allowing you to view any notifications that have been emailed to you directly in the Corporate Portal. When setting up a project that includes live events within the course, the time can now be set using a 12-hour format for Administrators who have country locations that utilize 12-hour formats instead of 24-hour formats. The Project Overview completion graph and Project Roster have been separated into two views instead of one. When first accessing a project, the Project Overview screen now defaults to just the completion graph. The Project Roster is now found on the second tab of the project listed as "Participants". The "Team Members" tab for adding Project Trainers has been moved to the Overview tab, making any project team members visible when first viewing a project. The "Dates & Details" tab and "Design" tab have been combined into a new tab listed as "Course", allowing you to adjust your deadlines and modify your course design from the same tab. The "Registration" tab has been combined with the "Participants" tab, so you can now upload participants or copy a project's self-registration URL from the same tab. On the "Participants" tab, an "Actions" menu now exists for each participant to the right of their completion status. This menu includes the "Participant access link", along with the new "Move" function link (see below for more information). It is now possible to move learners into new projects while keeping any assignment progress intact. To access the Move function, you must first access the enhanced Corporate Portal as noted above. Select the "Participants" tab of the project, and then locate the learner who should be moved. Blanchard Exchange will now compare the list of products in the existing projects to the list of projects in the destination project, also confirming the learner's eligibility (see the limitations noted above).